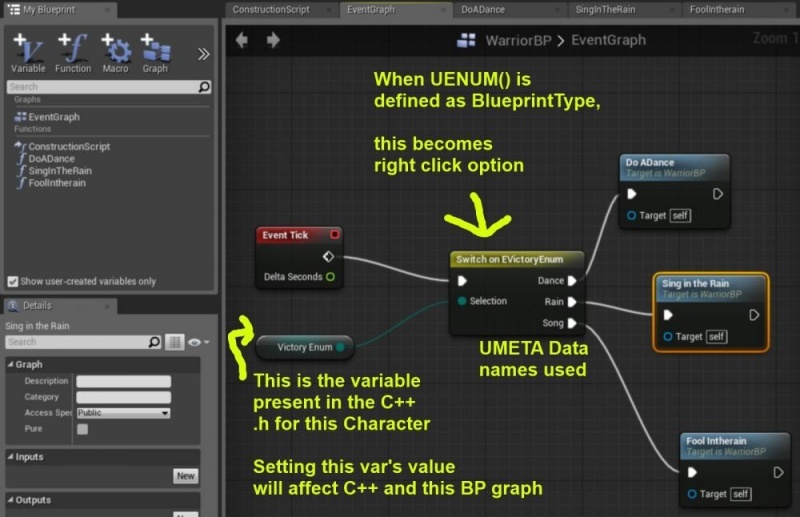 Here's how you can create your own Enums that can be used with C++ and BP graphs! Enums basically give you ability to define a series of related types with long human-readible names, using a low-cost data type. You need to add the UENUM definition above your class and then actually create a member variable in your class that you want to have be an instance of this enum. If you want an enum to be used in many different classes (instances of this enum in many classes) you can define the enum in some class that holds all your other important definitions like USTRUCTS(). return EnumPtr->GetNameByValue((int64)EnumValue); // for EnumValue == VE_Dance returns "VE_Dance"
Also, if you want to avoid retyping the enum class name as a string on every call to GetEnumValueAsString, you can also define a c++ macro in the .h file where the function is defined. EChallenge Challenge = GetEnumValueFromString<EChallenge>("EChallenge", ParseLine);  //Back From String! Now you know how to make enums that are project specific, that can be used in both C++ and Blueprints!